🏖 LOVE BEACH❓DUPLEX 〜 2 Bed/2 Bath/3 Balcony/4 POOL- VISIT 🏟 historical SiDE. Rarely can you say...The best of all worlds! TOMZ BOUTIQUE APT. is one of the nearest to the beach 🏖, only a short walk to beautiful SANDY BEACH ( BEACH CLUBS OPEN all year around‼️) through the protected sand dunes.Or pick your way over the Roman ruins to the old town. Cafe / bar onsite 🍻🍷. Late night drinks at the bar at the reception area. Pool side bar, restaurant, mini market and Turkish bath all on site. (Some facilities operated during the holiday season. 24 hour security all year around. Butcher/Green grocer/Super markets just around the first corner. Other lively local amenities minutes away. Our independent apartment is situated within this friendly family run, English speaking Apart--Hotel' who also owns 5 star hotel in SiDE for years. Enjoy breakfast on the balcony over looking farmland, with the sea, pine forest and mountains as a backdrop. They say that Mark Anthony and Cleopatra were the first tourists (?) here in SiDE and fell in love. You will too, just as we have! The big golden sandy beach is the least crowded on this side of town, but if you prefer, on the other side hotels line the beach front cheek by jowl. So many spectacular places you can visit both historical & cultural. Also fabulous shows at the SiDE amphitheater and, Aspendos theatre. The theme of TOMZ boutique apartment is PEACH & BLUE which blend with the local themes of BLUE SKY, SEA, PEACHES. and ORANGES. Once you step into the apartment, you will feel these colours which we carefully designed for your comfort !! WELCOME to TOMZ BOUTIQUE !!! 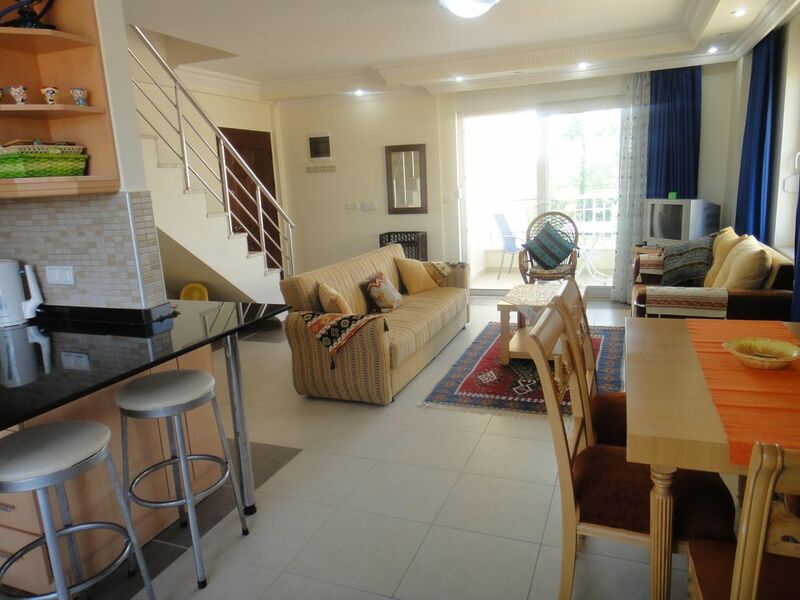 This beautiful 2 beds / 2 bath rooms DUPLEX apartment has air conditioning in all rooms. 2 terraces and 1 balcony with Torus mountains, Ancient Sogun pine forest, farm land & partial sea view. **Dining area: Beautifully curved dining table & chairs for 6 people. **JACUZZI bathroom: JACUZZI bath tub / shower head with beautiful glass closure. Prenty of towel hangers. The MARBLE staircase leads to the upper level which has two bedrooms, terrace, washing machine area and walk in double shower room. **Double bed room ( Peach room ): A very comfortable king size bed (160cm) 2 individual closet area. **This room is ideal for 2 - 3 kids/teenagers or twin occupancy, modest dresser/mirror & a large floor space. **Walking double shower ( 120cm): solar heated water. **Utility area: washing machine is situated at top of the staircase. Super markets, Shops, restaurants and cafes minutes away. **Saturday market at the next to Side main mosque. **Thursday market at the Manavgat town. From the picturesque harbour to lively nightclubs. A little further takes you to the adjacent town of Manavgat with water falls and riverside retaurants, Horse riding, cycling through the old pine forests. Jogging through the forest to the beach could be present route for enthusiastic JOGGERS?!! The surrounding area is so full of places to explore and activities, hard to know where to start ! NOTE: Onsite swimming pools, Hamam & Poolside main restaurant/bar is open during the holiday season. Deniz bar (at our apartment block, B - block) , breakfast is served here during off season. Sea water may warm enough to swim even during the off season like APRIL or NOVEMBER. Location, Location, Location! We chose our apartment, because it's duplex, and on the top floor of the building. As well as great views from balconies, lovely breeze through balconies & windows! Such an easy walk to the golden sandy beach with very relaxed atmosphere. All the beach clubs have own shower/changing cabins! Walking distance to the anciant SiDE town centre. Many markets, cafes in local and in the old town. On the lower floor, fully tiled, Jacuzzi bath with shower,basin and w.c. *Solar shower & Electric shower fitted. On the upper bedroom floor, fully tiled, walk-in double shower room, basin and w.c. *Solar shower. Plenty of towel hanging space! *Hair dryers in both bath rooms. *Hand soap is provided. 3 air conditioning through out the apartment. Air conditioning for both Cooler / heater. Free Wifi code will be get at the reception. Bath towels, hand towels, foot mat. Beach towels. Onsite Turkish bath / Sauna / Aroma, Oil, and Medical Massage during the open season. Upon request during off season. Sofabed x 1 (sleeps 1 ) Sofas x 2 and single chairs / coffee table with magazine rack. Balcony chairs in all 3 balconies with tables. Large family sized fridge / freezer. 3 Gus hobs and 1 electric hob. Easy use with 30 seconds button. Cafe-tie. Large 6 cups / 2 x one cup size. Frying pans all size / tall cooking pan / wok / milk pan. Dinner plates / salad plates / glassware / mug cups / Bread knife / kitchen knife / spoons / cutlery etc. Cooking area with a breakfast bar with 2 tall chairs. Egyptian styled wooden chairs with a dining table. Kids playing area in the main complex ground. Our friend’s restaurant, ‘Little Norway’ near by (200m), Pool table games all day long available! Some kids’s toys for swimming pools. We have modest library. Please bring your favorite films/music videos etc. Beautiful flowered, tree lined garden throughout the complex. 3 balconies with table and chairs. 1 at the master bedroom with pool and mountain view. 2 at the kitchen / salon with view. Lykia International Golf course in Belek. 30-40 minutes drive away. Suitable for family with kids / babies. Baby cot / high chair rentable at the reception. Strictly ONLY at the balconies. Operated during the holiday season. Aroma / Medical massages on request all year around. We have good sized 4 swimming pools throughout the holiday season ONLY. 4 kids pools. *Table tennis, kids play area. *Mini Football pitch & a beach volley ball court in the garden. * Hammam (Turkish bath) with Sauna, Steam room & massage *Cushions & hammock to relax. *Onsite bar / cafe. NOTE: Smoking allowed strictly ONLY at BALCONY, NO SMOKING at the indoor. Dear Sandra, Thank you again for renting our apartment. Yes, SiDE is fabulous and magical place, isn’t it?!! We visit here over 10 years, and always find something new discovery. Regarding massage / Hamam facility as you said very good facility we have. Especially Omar I always appoint him as his knowledge of medical information. And We love sauna/Turkish bath. We are very sorry you didn’t get enough cleaning services during your stay. Most of our guests have been satisfied, we will try to make sure the management do a better job. Thank you for your feedback. My wife and I had a lovely stay at Tomz Boutique. Arriving at 3 am, the night security guard was most welcoming and efficiently assisted us to the apartment. After a short rest, we headed off across the street to Irem Hotel, as we didn't fancy cooking, we spoke with the manager and after paying a small fee, was able to join the other hotel guests to the buffet breakfast - a really great start to our holiday. The apartment itself was well equipped for all our needs, clean, very spacious and even pool/beach towels were provided. Also, there is a washing machine within the apartment, which came in very handy halfway through our holiday. Equipped with a large TV, which we occasionally used to check the news and a large folder with detailed apartment instructions and flyers for booking excursions. The balconies overlook the pool, great for a morning coffee or evening drink and the sunsets were a pleasure to see. Throughout our stay, there was no noise heard from the adjacent apartments. The complex itself is in a lovely tranquil area of Side with very helpful staff available throughout the day and night. On one occasion, we needed to visit the main bus terminal to book the following days trip. Rather than instruct us which bus to take, they gave us a lift in their car, walked us to the correct booking office, speaking in Turkish to the sales rep and kindly drove us back - how's that for customer service ? Essential food supplies, along with tea, coffee and bottled water was already in the apartment upon arrival and we kindly replenished the stock before we left. The pools were clean with numerous loungers, parasols and tables beside and if one of the pools got crowded (rarely during our trip), we just visited the other. A free shuttle bus travels from Irem Hotel to the beach but if you prefer, it is only a short walk. There are plenty of restaurants, bars and shops within walking distance too. A huge thank you to Hinako and Tom for their hospitality and kindness. We will definitely be back. This was my first visit in Turkey, it was fantastic stay.Side is such a historical place, unexpected to see many antient buildings. Beach is also very pretty and relux to walk about the area. Reasonable price for local restaurants and bars, very tasty! Location of the apartment is very convenient to go to beach, old town. Every rooms are nice and bright, and clean throughout. Having 2 bathrooms were awesome! Perfect for a family holiday. We went to over night trip to Pamukkale that was such fun! I love to come back to stay at Tomz Boutique apartment again in near future! Thank you! Thank you for your lovely feed back. We are happy to hear your 1st ever visit to Turkey went so well. Average temperature of November is something like 20c, and the sea temperature is unexpectedly warm enogh to swim! People still do sunbathing at the beach we beliebe you DID?!! We hope to welcome you again! We booked this place for 3 days only but we wished that we could have stayed longer. The apartment was spacious & clean. The rooms were bright and I loved the 3 balconies. The staff were very friendly & helpful. Anything we needed, we only had to ask. we had a beautiful time to remember forever. We had an excellent holiday with my cousin thanks to Hinako and Tom. The place is great, everyone very helpful and kind. Hinako and Tom send us all the information before the holiday, they even recommended airport transfers. The place is a great location for couples as well as families, so much to do. Thanks again to Hinako and Tom, hope to visit again in tge near future. Thank you again for renting our apartment for your holiday in the late September which is also one of our favorate time to visit to SiDE, because SiDE offers the beautiful, hot climate throughout the month! We swam in the sea even in the late October to November, believe it or not! And as you epexperienced, there is so much to see and do. Please contact us anytime, we are happy to give you a SPECIAL OFFER!!! SiDE is 60km eastward from Antalya (nearest airport is Antalya ) offers very fine 2 BEAUTIFUL GOLDEN SANDY BEACHES which devided by historical citadel of Side peninsular. Only 400m wide, 1km long, this compact peninsular is perfect place to hung out for shopping and dinning after hot summer sun is set. Some of cafes and restaurants are sit on the 4th Century's Roman ruins and mozaik. Near by Manavgat water falls, lakes and river delta can be explored by boat. Perhaps this is why many people come back here again and again after they discover the local gems no other places can offer !! Please do feel free to ask any questions to us by email or simply call us, we are happy to assist. **Discount for long term rent more than 3 weeks, so contact us ! **OR... Why not rent a whole month?!! Our price is based on up to 6 guests. Baby cot on request 👶 **What's already included in OUR PRICE what you pay: Management service charges such as cleaning & linen service: 10% per nightly against the rent. Utility charges, such as AIR CONDITIONING, water, electricity & gas. *Smoking permitted ONLY at Terrace & Balcony. Ashtrays are in kitchen cupboard. *Baby cot / baby sitter services possible on request. Note: Tomz Boutique Apartment is a PRIVATE penthouse at an one of well established, trusted local apart-hotel complex, we have a safe box in a bedroom, and air conditioning are INCLUDED (no extra charge) We DO NOT CHARGE security deposit, we TRUST our guests will look after and enjoy for staying our apartment with RESPECT.